The Act of Congress authorizing the National Road required distinguishable marks or monuments to appear at regular intervals along the Road. In accordance with this stipulation, milestones were set at one-mile intervals along the north side of the Road. However, since the act included no specifications, the design and construction material of the milestones varied. In Ohio, the markers were square with curved heads. The five-foot tall markers were set directly into the ground with about three feet exposed. Each stone indicated the distance to Cumberland, Maryland, (where the Road began), at the top center, and the name of and mileage to the nearest city or village for east and westbound travelers. The earliest milestones were fabricated of a reinforced cementitious material in the 1830s. These concrete markers weathered poorly and many were replaced with sandstone markers in the 1850s. Later, concrete was used to replace some of the sandstone markers. Eighty-three existing milestones have been documented with the greatest number in the eastern counties. 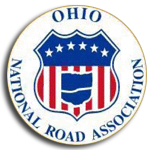 By the 1920s a uniform highway numbering system, with standardized road signs, identified the National Road and U.S. 40.